• The CLC will replace the Dobbs University Center and is slated to open in May 2019. • The three-story building will be approximately 114,700 square feet. • Architects are Duda Paine; the contractor is Holder Construction. • The facility includes a new campus restaurant with approximately 800 seats and a nearly 1,600-seat multipurpose room, both located on the first floor. • Student lounges and recreational spaces will be on levels 2 and 3 of the building. • A new open-air plaza will be constructed between the CLC and the AMUC. • The CLC design incorporates many energy savings technologies, including a geothermal field, chilled beams and solar hot water heating panels on the roof. • Occupancy sensors will help control lighting and cooling/heating. • Extensive computer modeling was employed on the project to reduce energy usage and glare inside the building. • The project will pursue LEED silver certification and should take 24 months to complete. To look at the DUC now, Perlman sees not so much the last gasp of a building in decline as a piece of campus on its way to being reborn with new life and functionality. “It does feel a little bit like some kind of Mad Max/Waterworld scene right now,” says Perlman, who has been overseeing the relocation of everything from student spaces and coffee shops to Winship Ballroom furnishings and a lone motorized scooter, which was left locked to a bike rack. The DUC — also called the “West DUC” or “the Portman Building” after Atlanta architect and developer John Portman, who designed it — opened on campus in 1986. The facility, with its distinctive tiered dining space, encloses the end of the Alumni Memorial University Center (AMUC), built in 1950 to honor campus community members lost at war, through the Coca-Cola Commons. A crucial part of constructing the new CLC will be separating the two buildings. Space between the AMUC and the new CLC will eventually be home to a large, open-air courtyard, with trees, grass and casual outdoor seating. 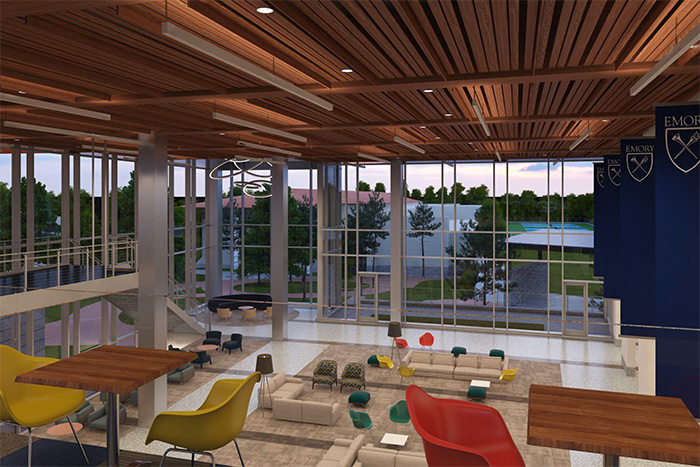 The new facility will feature a restaurant, student meeting spaces and a second-floor recreation lounge, complete with billiards, air hockey and video games. The move to replace the DUC was driven not only by growing space demands, but also the need for larger, more efficient dining services, technology and infrastructure upgrades, and more room for student gathering spaces. Developed with feedback from the campus community, the new CLC is scheduled to open in May 2019. It was designed to provide inviting, flexible spaces for student dining, programming and community-building — the biggest change to the facility in 30 years, Perlman says. For now, the exterior of the DUC stands enrobed in a wall of protective fencing and blue mesh sheeting as the campus prepares for a summer of profound adjustments. Public access has already shifted away from the DUC’s Asbury Circle entrance, and inside the AMUC interior doors and windows have been papered over and webbed with “caution” tape blocking access to the Coca-Cola Commons, now a dusty hard-hat-required construction zone. 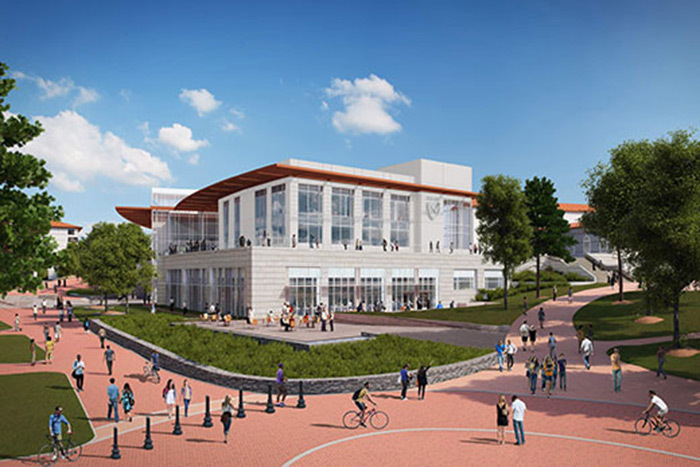 Over the next three to four weeks, workers will prepare for the demolition and removal of the DUC, while preserving the AMUC as a separate building, notes Perlman. “When it comes to the actual demolition, it’s a bit of a long march,” Perlman says. “The façade of the AMUC hasn’t been exposed to outside weather conditions in 30 years, so those surfaces will have to be sealed and water tested. The DUC demolition represents the largest tear-down of its kind on the Emory campus in recent years, says Al Herzog, Campus Services project manager for planning, design and construction. Salvage work is already underway to remove materials for reuse. “We’re looking at the ongoing recycling of some materials as part of the LEED program,” Herzog says. Other energy-saving elements in the building will include “chilled” beams to help cool air, solar roof panels for domestic hot water, a geothermal field and occupancy sensors to help pinpoint lighting and heating/cooling demands. With public interest in the project running high, Perlman says those who wish to track demolition and construction progress may follow along on the CLC project website, which will be revamped by June 1. There, visitors may sign up to receive a CLC construction newsletter, review frequently-asked questions and follow demolition/construction progress on a live webcam mounted near McDonough Field, he says. The site will also offer a “Rumor Mill” feature designed to address the latest campus buzz. “We’ve already been hearing that the demolition will require blasting — it won’t — and there’s also one floating out there that we’re building a secret basement — we’re not — and that there will be an underground tunnel connecting the old building with the new — which is not true,” Perlman explains.